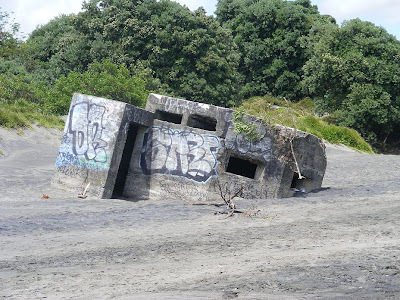 This now-decrepit concrete structure was built during World War Two as a guard post to man and help deter any Japanese invasion which might try to enter New Zealand from the sea here at Raglan. Though the structure is probably as strong now as it was when built it has suffered its exposure to all weathers over the previous 70-odd years. It has also been adorned by the usual mindless graffiti. i encountered some of these in Denmark last year - had no idea that Aotearoa was blessed with similar monsters! I always visit your blog, simple, pleasant but with amazing photos, I became a follower.